Definition at line 20 of file X86ATTInstPrinter.h. Definition at line 22 of file X86ATTInstPrinter.h. References getRegisterName(), MI, llvm::RISCVFenceField::O, printAliasInstr(), printCustomAliasOperand(), printDstIdx(), printInst(), printInstruction(), printMemOffset(), printMemReference(), printOperand(), printRegName(), printSrcIdx(), printSTiRegOperand(), printU8Imm(), and printVecCompareInstr(). Referenced by llvm::X86AsmPrinter::EmitFunctionBodyEnd(), llvm::X86AsmPrinter::EmitInstruction(), getRegName(), getShuffleComment(), printAsmMRegister(), llvm::X86MCExpr::printImpl(), printRegName(), and X86ATTInstPrinter(). 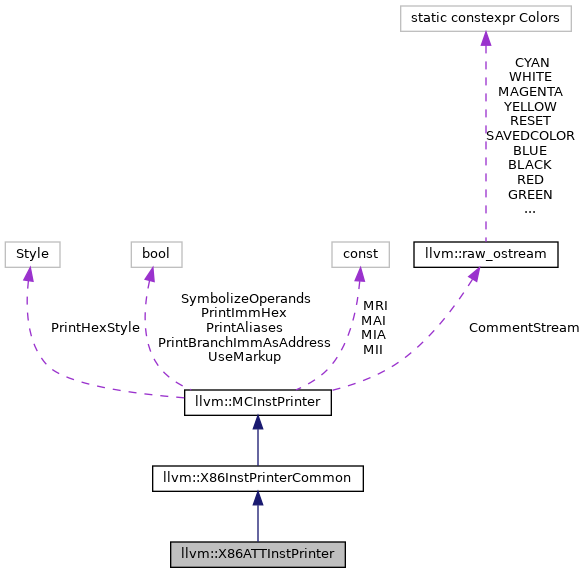 Referenced by printInst(), and X86ATTInstPrinter(). Definition at line 49 of file X86ATTInstPrinter.h. Definition at line 56 of file X86ATTInstPrinter.h. Definition at line 439 of file X86ATTInstPrinter.cpp. Referenced by printDstIdx16(), printDstIdx32(), printDstIdx64(), printDstIdx8(), and X86ATTInstPrinter(). Definition at line 96 of file X86ATTInstPrinter.h. Definition at line 99 of file X86ATTInstPrinter.h. Definition at line 102 of file X86ATTInstPrinter.h. Definition at line 93 of file X86ATTInstPrinter.h. Definition at line 62 of file X86ATTInstPrinter.h. Definition at line 41 of file X86ATTInstPrinter.cpp. References llvm::MCInstPrinter::CommentStream, llvm::EmitAnyX86InstComments(), llvm::MCSubtargetInfo::getFeatureBits(), llvm::MCInst::getOpcode(), llvm::MCInstPrinter::MII, printAliasInstr(), llvm::MCInstPrinter::printAnnotation(), llvm::X86InstPrinterCommon::printInstFlags(), printInstruction(), llvm::X86InstPrinterCommon::printPCRelImm(), and printVecCompareInstr(). Definition at line 108 of file X86ATTInstPrinter.h. Definition at line 111 of file X86ATTInstPrinter.h. Definition at line 114 of file X86ATTInstPrinter.h. Definition at line 105 of file X86ATTInstPrinter.h. Definition at line 450 of file X86ATTInstPrinter.cpp. References assert(), llvm::MCInstPrinter::formatImm(), llvm::MCOperand::getExpr(), llvm::MCOperand::getImm(), llvm::MCInst::getOperand(), llvm::MCOperand::isExpr(), llvm::MCOperand::isImm(), llvm::MCInstPrinter::MAI, llvm::MCInstPrinter::markup(), llvm::MCExpr::print(), and llvm::X86InstPrinterCommon::printOptionalSegReg(). Referenced by printMemOffs16(), printMemOffs32(), printMemOffs64(), printMemOffs8(), and X86ATTInstPrinter(). Definition at line 385 of file X86ATTInstPrinter.cpp. References llvm::X86::AddrBaseReg, llvm::X86::AddrDisp, llvm::X86::AddrIndexReg, llvm::X86::AddrScaleAmt, llvm::X86::AddrSegmentReg, assert(), llvm::MCInstPrinter::formatImm(), llvm::MCOperand::getExpr(), llvm::MCOperand::getImm(), llvm::MCInst::getOperand(), llvm::MCOperand::getReg(), llvm::MCOperand::isExpr(), llvm::MCOperand::isImm(), llvm::MCInstPrinter::MAI, llvm::MCInstPrinter::markup(), llvm::MCExpr::print(), printOperand(), and llvm::X86InstPrinterCommon::printOptionalSegReg(). Referenced by printanymem(), printbytemem(), printdwordmem(), printopaquemem(), printqwordmem(), printtbytemem(), printwordmem(), printxmmwordmem(), printymmwordmem(), printzmmwordmem(), and X86ATTInstPrinter(). Definition at line 52 of file X86ATTInstPrinter.h. Definition at line 352 of file X86ATTInstPrinter.cpp. References assert(), llvm::MCInstPrinter::CommentStream, llvm::format(), llvm::MCInstPrinter::formatImm(), llvm::MCOperand::getExpr(), llvm::MCOperand::getImm(), llvm::MCInst::getOperand(), llvm::MCOperand::getReg(), llvm::MCOperand::isExpr(), llvm::MCOperand::isImm(), llvm::MCOperand::isReg(), llvm::MCInstPrinter::MAI, llvm::MCInstPrinter::markup(), llvm::MCExpr::print(), and printRegName(). Referenced by printDstIdx(), printMemReference(), printSrcIdx(), printU8Imm(), printVecCompareInstr(), and X86ATTInstPrinter(). Definition at line 65 of file X86ATTInstPrinter.h. Definition at line 37 of file X86ATTInstPrinter.cpp. Referenced by printOperand(), printSTiRegOperand(), and X86ATTInstPrinter(). Definition at line 425 of file X86ATTInstPrinter.cpp. References llvm::MCInstPrinter::markup(), printOperand(), and llvm::X86InstPrinterCommon::printOptionalSegReg(). Referenced by printSrcIdx16(), printSrcIdx32(), printSrcIdx64(), printSrcIdx8(), and X86ATTInstPrinter(). Definition at line 84 of file X86ATTInstPrinter.h. Definition at line 87 of file X86ATTInstPrinter.h. Definition at line 90 of file X86ATTInstPrinter.h. Definition at line 81 of file X86ATTInstPrinter.h. Definition at line 478 of file X86ATTInstPrinter.cpp. References llvm::MCInst::getOperand(), llvm::MCOperand::getReg(), llvm::MCInstPrinter::markup(), printRegName(), and Reg. Definition at line 77 of file X86ATTInstPrinter.h. Definition at line 469 of file X86ATTInstPrinter.cpp. References llvm::MCInstPrinter::formatImm(), llvm::MCOperand::getImm(), llvm::MCInst::getOperand(), llvm::MCOperand::isExpr(), llvm::MCInstPrinter::markup(), and printOperand(). Definition at line 78 of file X86ATTInstPrinter.cpp. References llvm::X86II::EVEX_B, llvm::X86II::EVEX_K, llvm::X86II::EVEX_L2, llvm::X86II::FormMask, llvm::MCInstrInfo::get(), llvm::MCInst::getNumOperands(), llvm::MCInst::getOpcode(), llvm::MCInst::getOperand(), llvm::MCInstPrinter::MII, llvm::X86II::MRMSrcMem, llvm::X86II::OpPrefixMask, llvm::X86InstPrinterCommon::printCMPMnemonic(), printdwordmem(), printOperand(), printqwordmem(), llvm::X86InstPrinterCommon::printVPCMPMnemonic(), llvm::X86InstPrinterCommon::printVPCOMMnemonic(), printxmmwordmem(), printymmwordmem(), printzmmwordmem(), llvm::MCInstrDesc::TSFlags, llvm::X86II::VEX_L, llvm::X86II::VEX_W, llvm::X86II::XD, and llvm::X86II::XS. Definition at line 59 of file X86ATTInstPrinter.h. 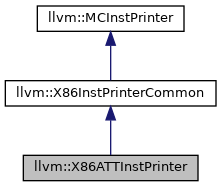 Definition at line 68 of file X86ATTInstPrinter.h. Definition at line 71 of file X86ATTInstPrinter.h. Definition at line 74 of file X86ATTInstPrinter.h.